Halfway through the workday, clinic director Dr. J. Smith receives a prompt on his computer screen that all files have been encrypted and in order to decrypt the stored files and folders, a ransom must be paid. If he doesn’t pay, his fate is sealed – he will lose his data forever. Frantic, Dr. Smith rushes over to the other five computers connected to the office network. To his dismay, those machines have also been encrypted. He has IT examine the external hard drive (connected to the server computer for daily scheduled backups) and all the files are also encrypted. After exploring all options, the only hope of retrieving the data is to negotiate with the cyber terrorists. In this scenario, not only are the files stored on the director’s computer, but on ALL of the network-connected devices – including external hard drives, and mounted drives. And that includes all documents attached to patient cases in Universal Office. Desperate, Dr. Smith concedes and pays a couple crypto-currency coins. After several nerve-wracking hours and zero certainty, the data was returned unaltered. Unfortunately, this situation is becoming far too familiar to more and more small businesses. In 2018, we received more than a dozen encryption incidents. And unfortunately, not all of them ended as well as the case of Dr. Smith. Ransomware intrusions, viruses, and hard disk failures are the most common ways that valuable data is lost or compromised. It’s our time to fight back – through protection. Set it and forget it – that’s the goal for the ultimate back-up service. This ensures back-ups are scheduled and completed regularly without fail. Continuous Data Protection (CPD) automatically recognizes changes to data and creates back-ups in real time, all while avoiding slowing down your workstation. Keep in mind that regularly scheduled backups still need to take place for larger files. It is essential that our valuable data is stored with the utmost security and through a trustworthy and dependable source. Military-grade security, a proven track record and credibility are paramount with the sophistication of cyber hackers today. Do you know how often back-ups to external local hard drives, network drives, and USB sticks actually fail? Often! When disaster strikes, you can be left with data that is several months old, AND in some cases, even years. Without a notification system in place, you will never know that your back-up has stopped working. This is why receiving daily back-up summary reports and data failure notifications is extremely important. Versioning is a feature that keeps several copies of each file, ultimately protecting against expensive ransomware viruses. Well, every time the file is changed or re-saved, the system stores every version of it. This allows you to go back in time and restore the previous version of the file. It’s simple: affordability equals accessibility. Our goal is to ensure back-ups happen regularly so that when disaster strikes, you are up and running in as little time as possible. The good news is that we have an affordable solution that won’t compromise necessary features. It’s easy to use and understand – for even the least tech-savvy user. And above all, why incur additional costs for back-up management when it can all be done in-house? We’ve researched many cloud-drive solutions for you to ensure all the necessary criteria is met. We looked through Canadian and U.S. vendors. And, among many others, we compared Dropbox and Sync.com – while inexpensive, reputable, reliable and integrated with file versioning, the problem is that they do not offer an automatic notifications feature that lets users know whether back-up was completed or failed. After an extensive search, reviews, and comparisons, we stopped on IDrive, which meets all five criteria mentioned above. Their services are feature-rich, reliable, secure, equipped with versioning, provide options to configure email notifications, and come at a very competitive price. In fact, they haven’t been beaten by any competitors so far in terms of price and features offered. As of January 2019, the price for 2TB of storage is only $52.12 USD for the first year and $69.50 for every year after that. For most small businesses, 2TB is plenty of storage for years to come. For larger organizations, a 5TB storage plan is available for only $99.50 per year. We can proudly say Antibex Software is an IDrive user for our backup needs – so as an added benefit for our customers, we will help you choose a plan, open an account and configure the back-up of your Universal Office data. 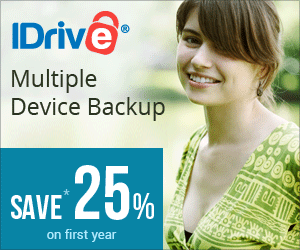 Call our technical support team today to help configure your IDrive back-up from A to Z, for FREE! While IDrive data centres are physically located in the U.S., this service is HIPAA, SOX, GLBA and SEC/FINRA compliant. It’s also compatible with Windows and Mac computers, as well as with the Synology NAS. No wonder IDrive has been selected four years in a row as the editor’s choice by PCmag.com. If you’re ready to adopt our level of data security, we’re ready to help you get started!